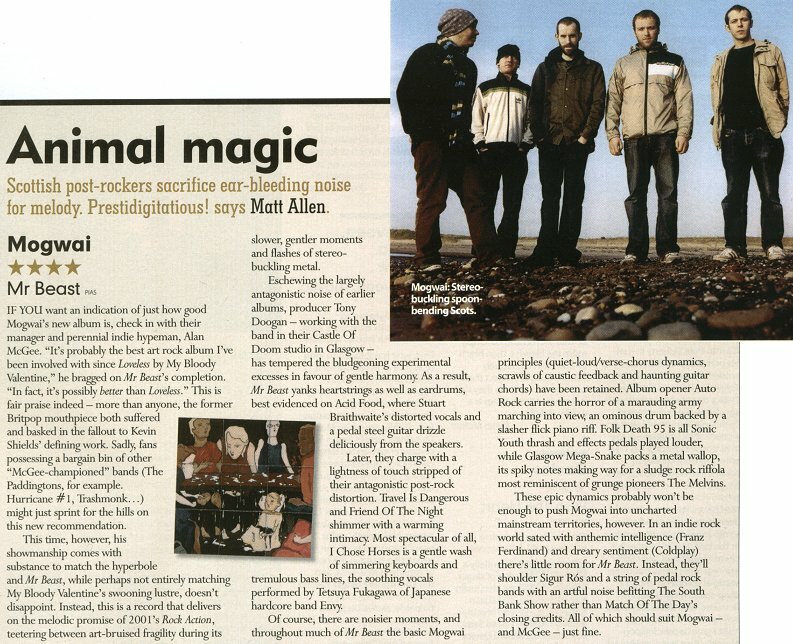 This article is about the album from Mogwai. For the YouTuber, see MrBeast. 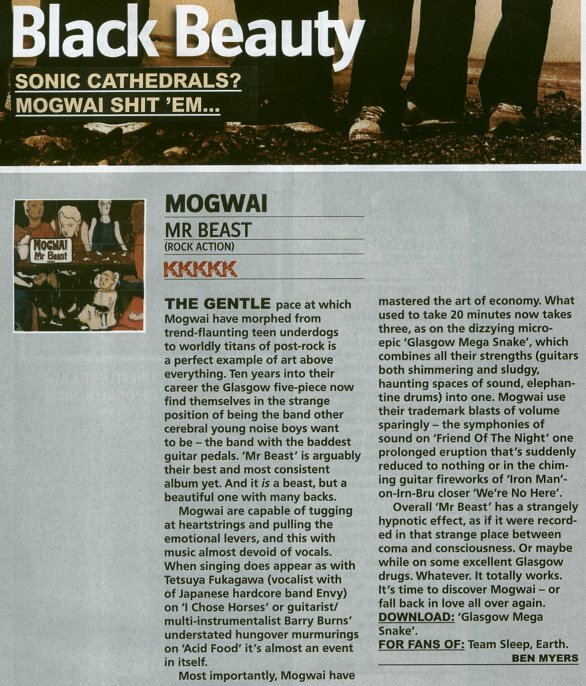 Mr Beast is the fifth full-length studio album by the Scottish post-rock group Mogwai. In 2007 it was awarded a gold certification from the Independent Music Companies Association which indicated sales of at least 100,000 copies throughout Europe. The album's title stemmed from an incident where Barry Burns and Dominic Aitchison landed in Florida to start a tour with The Cure in 2005, when they saw a taxi driver standing outside the airport holding a sign that said "Mr. and Mrs. Beast" which, after a 10-hour flight, was "funnier than life itself". The cover artwork for Mr Beast is a painting by Amanda Church entitled "Milkbar", and the accompanying booklet contains other works from her, all of a similar style. In addition, the Mogwai Young Team logo is displayed on the spine of the deluxe edition release, with a silhouette of Jesus on the cross visible within the logo. All songs were written by Stuart Braithwaite, Dominic Aitchison, Martin Bulloch, John Cummings, and Barry Burns. Lyrics on "I Chose Horses" written by Envy vocalist Tetsuya Fukagawa. Stuart Braithwaite – guitar, vocals on "Acid Food"
Barry Burns – piano, guitar, flute, vocals on "Travel Is Dangerous"
Craig Armstrong – keyboard on "I Chose Horses"
Tetsuya Fukagawa – vocals on "I Chose Horses"
^ "Mr. Beast by Mogwai". Retrieved 3 October 2016. ^ Myers, Ben. "Black Beauty". Kerrang. Retrieved 9 January 2013. ^ Allen, Matt. "Animal Magic". Mojo. Retrieved 9 January 2013. ^ Woodhouse, Alan. "Mogwai - Mr Beast". NME. Retrieved 9 January 2013. ^ "Mogwai: Mr. Beast | Album Reviews | Pitchfork". Pitchforkmedia.com. 5 March 2006. Retrieved 2 March 2012. ^ a b Segal, Victoria. 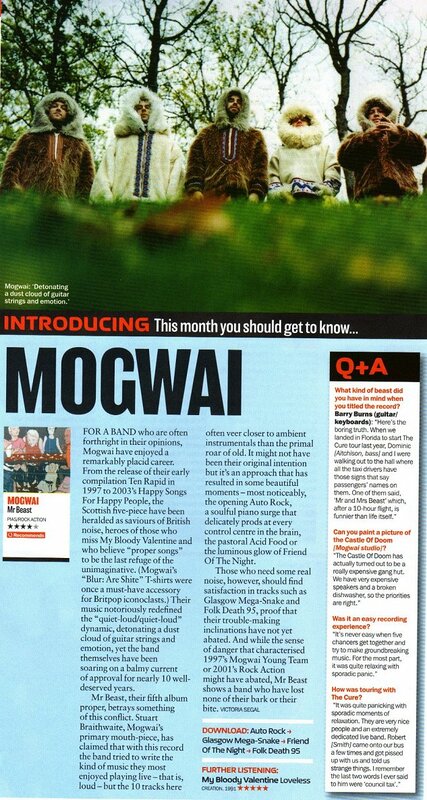 "Introducing Mogwai". Q. Retrieved 9 January 2013. ^ Marshall, Joe. 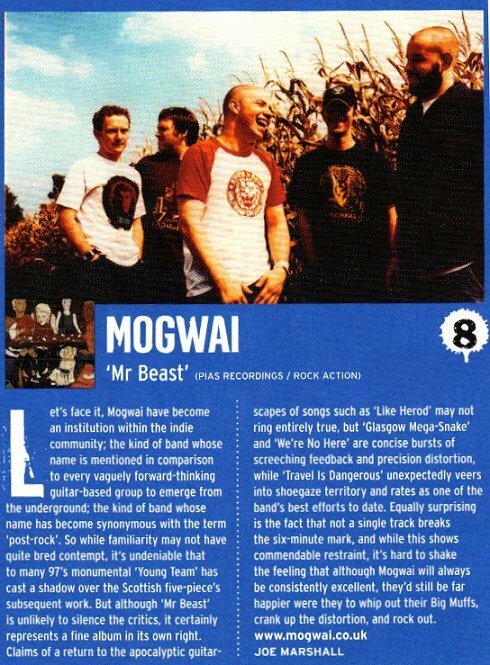 "Mogwai - Mr Beast". 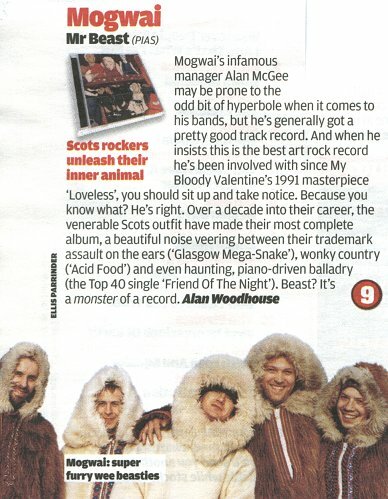 Rock Sound. Retrieved 9 January 2013.